PGF Begins Today- FC Open House Monday! 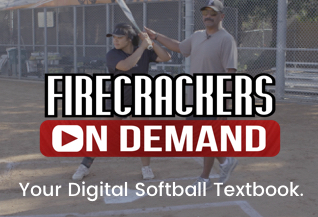 The final push of the 2018 championship season is here and an astounding 37 Firecracker teams will be represented over two weeks at the Premier Girls Fastpitch National Championships beginning today. Week One will feature the 18U Premier and Platinum, 12U Premier and Platinum, and 10U Premier divisions while Week Two will host the 16U and 14U Premier and Platinum divisions. Double elimination bracket play begins Monday, July 23rd. For the full schedule of events you can visit the Week One and Week Two links on the PGF website or click here. While you’re in town be sure to check out the Firecracker warehouse and gear store! There will be an open house following opening ceremonies Monday, July 23rd and Monday July 30th. 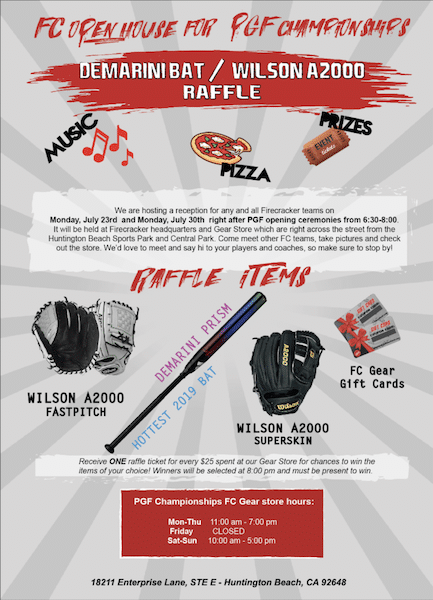 Don’t miss out on this opportunity to meet some of your fellow Firecrackers and possibly walk away with some FC swag! Hope to see you there! Previous ArticleThe Coaching Shift is ON!